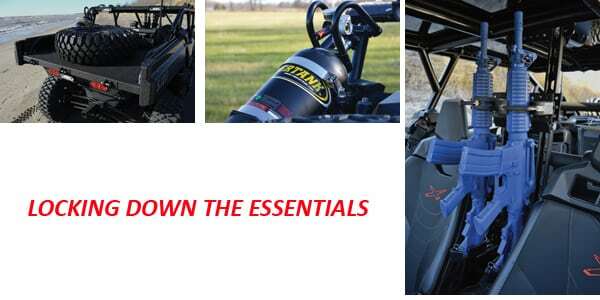 The endless applications for UTVs are one of the primary reasons we’ve seen this segment take over the market in recent years. From farming, to hunting, to property maintenance and recreation, there are category specific models throughout the OEM lineups. But what happens when you need a highly specialized vehicle to meet very specific needs? You don’t want to pick a designer suit off the shelf, you want a tailor to custom fit a suit to your needs. 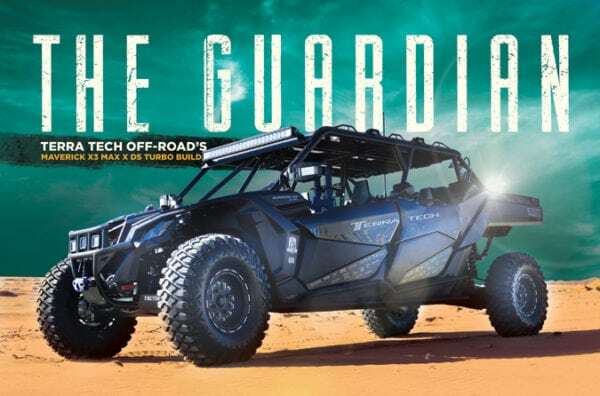 Well, your “tailor” in the UTV world is Terra Tech Off Road, and their “Guardian” build is the epitome of a specialized vehicle. The beginnings of The Guardian entailed a trip to Terra Tech Director Mike Bennett’s local Can-Am dealer. 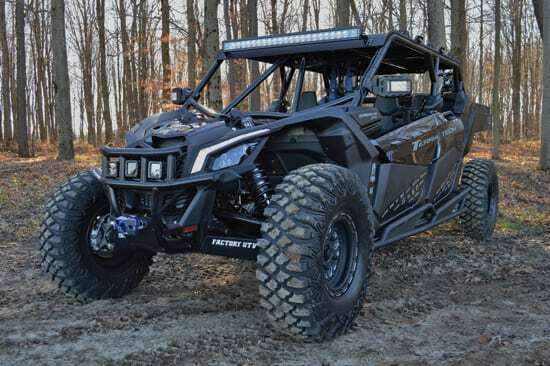 A 2017 Can-Am Maverick X3 Max X DS Turbo was loaded on the trailer, and work began converting this car into the ultimate border patrol vehicle. No stone was left unturned in developing this specialized defence vehicle. 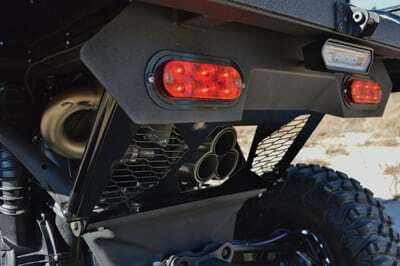 The finished product was on display in this year’s ATV World booth, and from the moment we laid eyes on this beast, we knew we had to break it down. So let’s take a look at just how intricate Terra Tech got with The Guardian. If you’re going to build a car to protect borders, whether it be for private property or internationally, you’re going to need to get from HQ to the border breech in a hurry. The Turbo R power plant that propels The Guardian is no slouch in this department, with a top speed of 137kmph. That being said, adding a Yoshimura exhaust system mated with a Donaldson High Performance air filter helps this car breathe easier, and still reach 100kmph in under 6 seconds. Now that The Guardian is on site and ready to deal with the situation at hand, you better hope the tools you packed for the job, made it there safely. The RP Advanced Bed takes the traditionally minimal storage on the X3, and creates a fully customizable storage area. Terra Tech outfitted the bed to store a spare tire, compressed air system and eventually, fuel canisters as well. You might hear folks saying that today’s cars are oozing with the latest tech. But take one look at the hardware Terra Tech has outfitted to the Guardian, and you’ll quickly realize there’s room to grow. Worried about getting lost on your patrol? The Lowrance HDS 7 GPShas you covered. Need to radio back to base? The Rugged Radios RM-50 kit with upgraded antenna will make sure you’re heard loud and clear. Need to know the whereabouts of your platoon? The Track 24 Military Vehicle Tracking system has you plotted and mapped. Needless to say, the tech on this unit is on the cutting edge. There’s only one piece left to dissect for The Guardian build, and it’s the most important all. When you arrive at the scene, you want to make your presence known and establish whose turf you’re on. Coupling what essentially amounts to the entire Rigid Lighting catalogue, with everything from 5-0 lights to Infrared, along with a powersports hot/cold weather siren, not only will you arrive at the scene in a hurry, with the knowledge that you’re on the fastest route, but the trespassers will certainly be aware of your arrival, if that’s the approach you’d like to take.